Hoping to stand out from the pack of Chromebook manufacturers, Samsung released information on two new advanced versions of the usually spartan Android-powered laptops. Called the Chromebook Plus and the Chromebook Pro, both merge popular features most often found in tablets, like touchscreens, styluses, and an app store. Perhaps chasing after the success of Microsoft’s Surface, both new Samsung Chromebooks fold completely back and allow the user to switch from laptop to tablet mode. This is a huge draw for some users and it may indicate a new design trend for Chromebooks to come. The Chromebooks also both feature an included stylus which conveniently docks inside the device to prevent misplacing it. 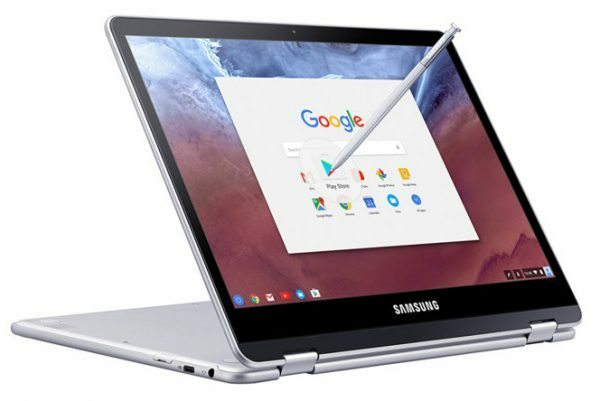 As part of a handful of Chromebooks able to access the Android App Store, the two Samsung Chromebooks will allow you to work offline in a number of apps as well as enjoy a number of games and applications previously unavailable to Chromebook users. The Chromebook Plus priced at $449 is being released this week while the Chromebook Pro at $549 will be available in April. Visit Samsung.com for more info. .exe and metro apps. Also the Chromebook flip has been around for a few years as a ChromeOS convertible, the pro/plus aren’t pioneers in this formfactor. I was looking on getting the Chromebook Plus but reviews has been bad so far. It looks and sounds good on paper but actual usage fell short of expectations. Other than price, what is the real advantage of a Chromebook over a lightweight laptop? If I’m going to carry a laptop sized and weighted device around with me, I’d rather have one with a full OS. > what is the real advantage of a Chromebook over a lightweight laptop? I’m actually considering the Chromebook Pro (m3, x86 cpu) not because of ChromeOS itself but because historically Chrome hardware tends to be very compatible with Linux. I wasn’t aware that they could run native Linux apps. That is very interesting and now I might have to try one. The “easiest” way is through the use of *crouton*. A search for “running linux in chromeos with crouton” pops up some good detailed and recent how-tos. I’ve never done this myself so the Samsung Pro (if I decide to buy) would be my first attempt. Note: Intel CPUs are best suited for this. Once a Linux Distro is installed via crouton, switching between the two environments is a matter of pressing the key combinations – Ctrl+Alt+backArrow and Ctrl+Alt+forwardArrow – to switch between the two environments. Pretty cool solution. Personally, I’ve shied away from Google and Microsoft offerings because of the privacy issues (this is not a factor for most users presently) which is why I’m considering the Samsung Pro as a Linux-only machine (would use *chrx* for the installation).